Lake Okeechobee is the second largest freshwater lake in the United States. The 730 square mile lake is located in south central Florida. It is shallow (average depth 9 feet or 2.7 meters) and provides an ideal habitat for bass. The Big “O” is the place to go if you want to catch big bass. It is a fisherman’s paradise. You can expect to tangle with 7-10 pound bass. The lake record is 15 pounds 5 ounces. While fishing is very good year-round it is particularly spectacular during spawning season. Lake Okeechobee has a number of famous fishing areas including the Monkey Box, Moonshine Bay, Fisheating Creek, Hay Fields, and the Cow Pasture. We strongly promote a “catch and release” policy for all bass caught in Lake Okeechobee, however we would gladly help assist you in getting your trophy fish mounted. We can point you to the right place to get a skin mount or replica made so you can forever capture your memorable catch. 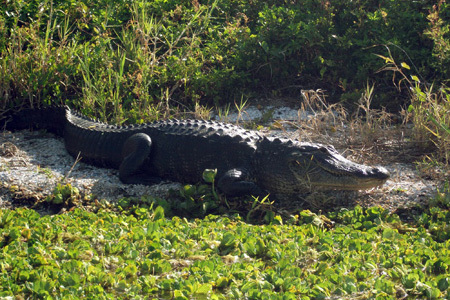 Wally the gator was laying on the bank offering photo ops again today, that’s one big lizard! A typical beautiful sunrise on Lake Okeechobee. 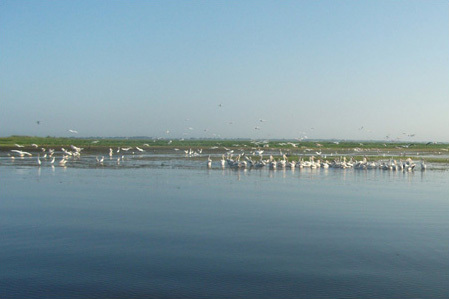 100′s of white pelicans feeding on grass shrimp in the Okeechobee marsh. Okeechobee is full of all types of beautiful vegetation, Pickerelweed is used by bass when they are building a spawning site, they fan their beds around the bottom of the clumps and then can protect their fry for a while once they hatch. One of the most important battles of the Second Seminole War took place in central Florida and is known as the “Battle of Lake Okeechobee”. On Christmas 1837, eight hundred American troops and state militia, commanded by Colonel Zachary Taylor, fought 400 Seminole and black warriors at Nubbins Slough. The Battle of Lake Okeechobee resulted in a humiliating defeat for the army. The U. S. forces suffered heavy losses (26 killed and 112 wounded). And, while the Seminoles losses were considered minimal (11 killed and 14 wounded), they fled to the relative isolation of the Everglades and their concerted resistance was broken. In 1842, the U.S. Army conceded that the remaining Indians should be allowed to remain in Florida. While the Second Seminole War was officially over. The Seminoles were one of the only tribes to never officially surrender.